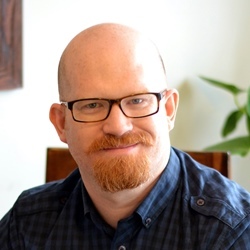 Danny Kingston fills us in on the twists and turns of the Central heat of Great British Menu, with yet another re-imagining of coronation chicken and plenty of personal stories from the three hopeful chefs. Like a lot of people of a certain age, I have recently taken to keeping an eye on the amount of ‘steps’ I take on an average day, monitoring daily through the use of an app on my phone and with the goal of removing a couple of spare tyres from my midriff. So far, I have been very pleased with my progress. The walks to the corner shop have started to make a difference and at the rate I am going, I should lose a couple of pounds in about, oooh, five years’ time. To take things up a notch though, I think I am going to need to trail newbie Danny Gill for a week or so. 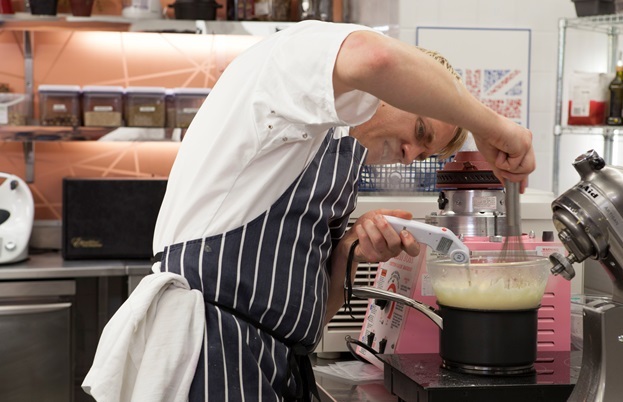 After watching Daniel Clifford’s protégé (and, until quite recently, head chef at his gastropub The Flitch of Bacon) dash about the GBM kitchen during this week’s Central heats, I’d say that boy would get me back into my Speedos in no time at all. 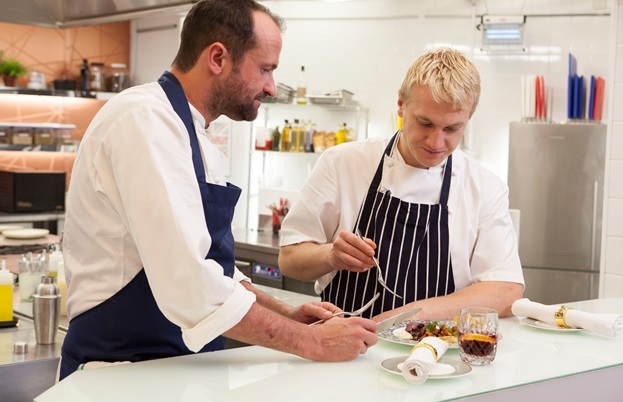 Keeping up with the pace were two other newcomers, namely Andrew Scott, executive chef of Restaurant 56 and Daniel Smith, chef-patron of The Ingham Swan in Norfolk. Older chefs yes but no less nimble and so the race to finish line was fairly frenetic all week. Was it exhausting to watch? Yes, very. Thankfully, Angela Hartnett was in charge to keep a beady eye on proceedings, and to show that she ain’t no pussycat. 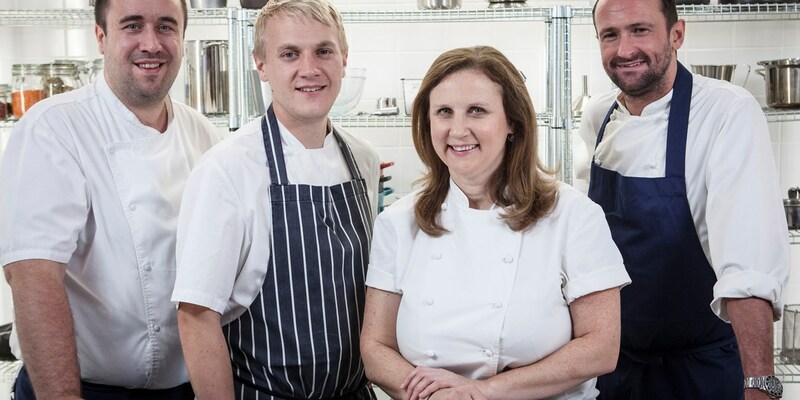 It was rather lovely in fact, to see all three chefs visibly gulp when Angela raised an eyebrow and said ‘Oh, you think I am an easy target do you boys?’ Jeepers. Cracking into the starters then, Andrew decided to honour two men who were responsible for setting up a food bank in his region. Called ‘On The Breadline’ his aim was to take humble ingredients such as oxtail and celeriac and to pimp them up for the banquet. He very nearly got there too, after a fumble with the pressure cooker. But for Angela, his soup was too safe and his crisps were too soggy. Danny, going at full pelt, decided to reimagine coronation chicken for his starter and personally, I am beginning to wonder just how many more reincarnations of this dish we are going to see on this series. Still, despite using Angela’s demon ingredient coriander, she saw promise in his use of crispy chicken, raw scallop and curried shallot rings. Daniel, a classic man at heart, plumped for the local line and used native Norfolk partridge to showcase his dish ‘Making A Difference’, along with consommé that was poured into shotgun cartridges and packed with flavour. Poker faced Angela however, suggested there was a lot more to do. With that in mind and heading into the fish round, Angela wanted to see 10s appearing on the table and as such, our chefs ramped things up. Danny certainly used an element of risk when he went about constructing his modern take on salmon, cream cheese and cucumber sandwich. He even brought a washing machine into the kitchen to produce a cucumber consommé, leaving Angela looking slightly bewildered. OK, it was an ‘evaporator’ but the techno-gadgetry paid off as our mentor thought that his two-part dish using aerated cheese and edible flowers was ‘sublime’. For the other two, well, it became a battle of the crabs. Cornwall vs Cromer. The latter being championed by Daniel and used to champion the volunteer lifeboat men and women who risk their lives in his hometown of Caister. Combining herb buttered lobster along with the crab, cheese custard (i.e. sauce) and samphire, the other chefs were suitably impressed. Although Andrew did spot some shell on Daniel’s plate, by way of saying to the audience – ‘Miss, Miss! Look! He didn’t prepare this properly!’ But maybe he did that to cover a few issues with his own course. Andrew’s crab biscuit for instance proved troublesome and, yawn, he was doing a take on coronation chicken too. Angela did like his grainy crab panna cotta though. Heading into the mains, as is becoming standard at this stage of the competition, things were neck and neck. Or ‘cou en cou’, as they say in France. Trailing behind slightly, Andrew had to up the ante and with his tongue twisting ‘Ma’am’s Balmoral Birthday Venison’. He certainly did that. Using venison as the star of the show, he roasted some loin and slow cooked a gamey ragù to plate upon a ‘forest floor’, peppered with game chips and cosseted with spicy bread sauce and Angela was impressed. Especially by his crispy hispi cabbage. Consistent Daniel also went full on meat, elevating the Sunday roast with locally sourced shin and fillet of beef. Again, this was a familiar theme and because of that, it all sort of fell flat. 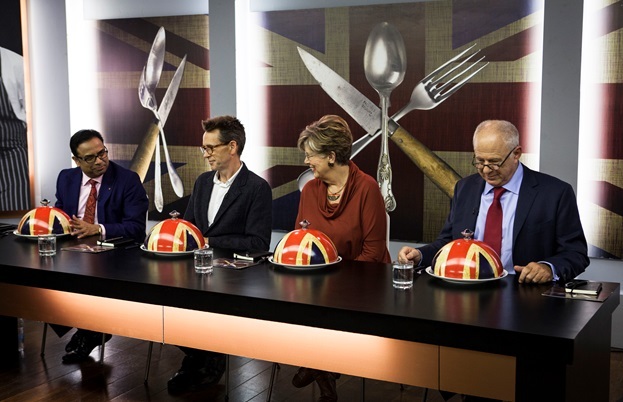 His cauliflower and shallot puree gained applause but the Union Jack cloche he used to cover everything could not hide the fact that Daniel wasn’t really telling a story. And what was he doing making pommes dauphines instead of proper roasties? Mon dieu. It was nice to hear some laughter in the kitchen though, when Danny dropped his pears on the floor after talking about his ‘Fallow the Dream’, a venison wellington in honour of his Dad. The mood this week was notably more jovial actually. Was this down to Angela I wonder? Anyway, Danny did well with his traditional approach but I am sure he was kicking himself for not resting his welly for long enough. I know he definitely swore after plating up. Something like...Horlicks. The desserts round loomed and the scores were tighter than a very tight lid on a jar of pickles. So once more, all three chefs really had to push themselves. Running around yet again came Danny, wheeling out yet another hunk of machinery in the form of a candy floss….flosserator. His pudding was called a ‘Jam Penny’ in reference to the Queen’s tradition of handing out coins called ‘Maundy Money’. Yet despite all the theatre, the tempered chocolate and the laces made from raspberries, it was all a tad unclear. Daniel’s twist on a peach Melba had a lot more clarity and bar a painful moment when trying to set his jelly, he executed a very elegant looking pudding; with poached peaches, pistachio snow and a Bellini, made from peach foam topped with English fizz. Andrew’s personal take on afternoon tea was the best looking dessert in my opinion. Inspired by a lady called Rita, who he worked with when he was a mere whippersnapper and who has been serving this classic for over forty years, Andrew created a fitting tribute. Small lemon meringue tartlets, teacups filled with Cambridge burnt cream and topped with blueberry sorbet and dainty doughnuts all looked great and fitted the brief. But it wasn’t enough. He missed out by a point and so both the Dannyboys went through to the final judging round. Joining our judges this week was Enam Ali, a respected food entrepreneur who originally came to this country to study law and ended up setting up the Curry Awards, helping to cement one of the nation’s favourite dishes into our psyche. What Enam wanted was the ‘wow factor’ and ‘the divine’. Whereas Matthew Fort, well he just wanted food that he could eat. So there was quite a broad spectrum for our chefs to operate in. Once more, a series of highs and lows were set in store for our judges and in the first two rounds, I would have said that it was Daniel who hit the ground running. Rather than Billy Whizz Danny. 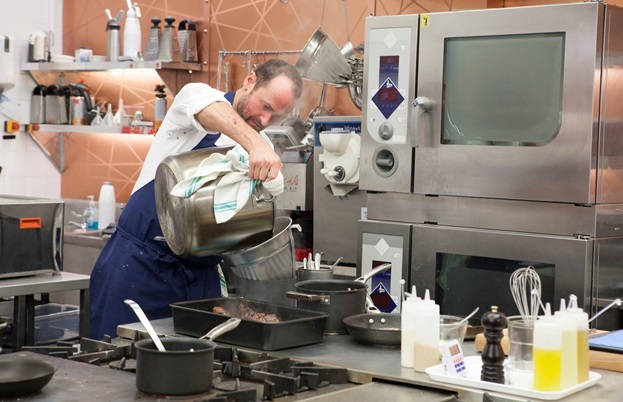 His game starter was cheered for intriguing smells and powerful consommé and his fish dish was deemed perfect by Oliver Peyton. Matt may have felt that all the accompanying ropes and nets were unnecessary but it was still perfect in his eyes. By contrast, Danny’s floral tribute to start, the coronation chicken, was just too much much. ‘It’s exhausting to look at,’ moaned Oliver. Although it did tickle Prue Leith, who gave it an 8. But then Danny smashed it with his venison wellington by giving some more context with a written memo about his Dad and by resting it for longer. It was a ‘lesson in restraint’ according to Oliver. Going into the puddings round, it did seem as though Daniel was going to claw things back with his refined dessert of peach Melba, over Danny’s obscure and ectoplasmic mess. However, when it came to the totting up of the scores, the young blonde chef’s ‘explosion of imagination’ was just enough to see him through to the banquet finals. And for some reason, I can’t see Danny resting on his laurels. The other chefs will have to don their running shoes I reckon, just to keep up.